This 6-inch Rapid Fire Armstrong Rifle was purchased from England in 1898, because the United States did not yet have the capability to produce a small, rapid fire weapon for the defense of its principal harbors. The advent of the Spanish-American War brought about the need for such weapons in this area due to the close proximity of Cuba to Florida. Funding for these guns was included in the appropriation for the "National Defense Act" of March 9, 1898. 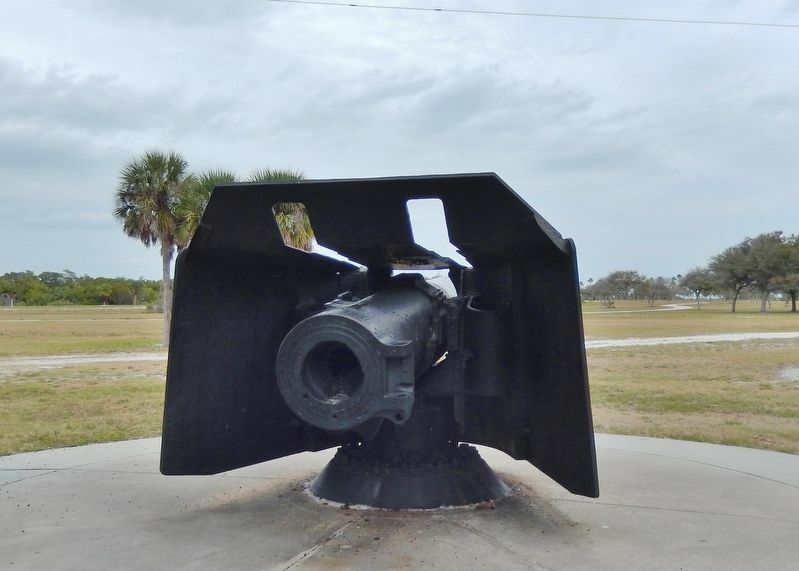 The installation was completed as a part of the armament of Fort Dade, on Egmont Key, on December 10, 1898. (Approximately 2 miles southwest of where you are now.) 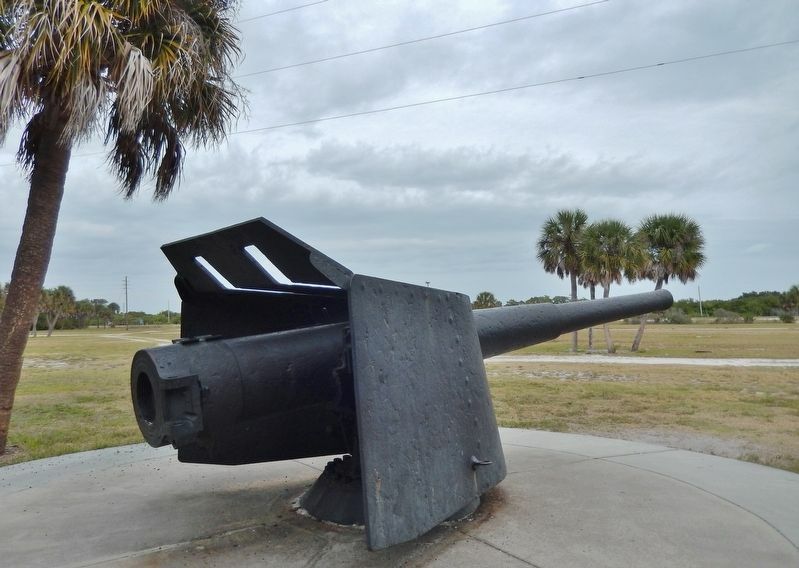 The guns were placed under the command of an artillery detachment sent from St. Francis Barracks in St. Augustine. Only a limited number of these particular weapons were purchased by our government and these two rifles, are believed to be the only remaining models still in existence. 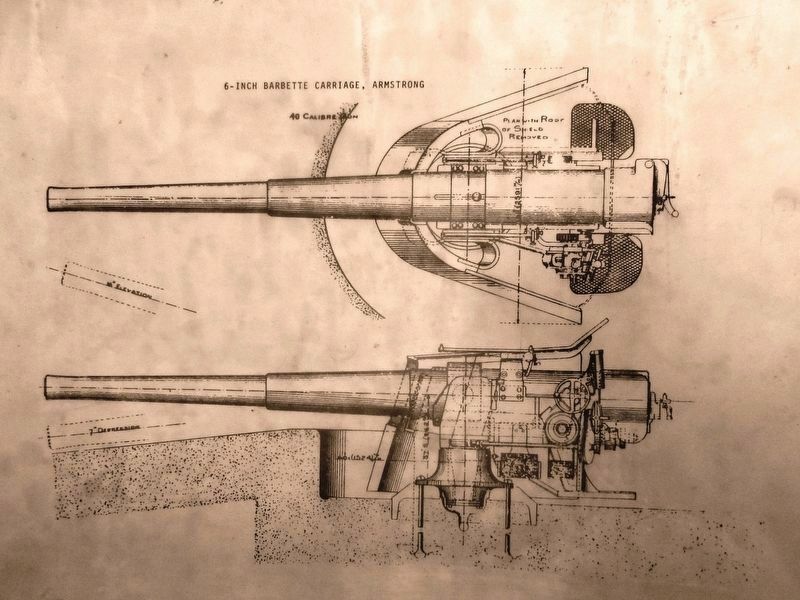 Fort Dade was deactivated in 1921 and these guns, which were intended to defend the southwest pass into Tampa Bay, were left to the mercy of the elements. 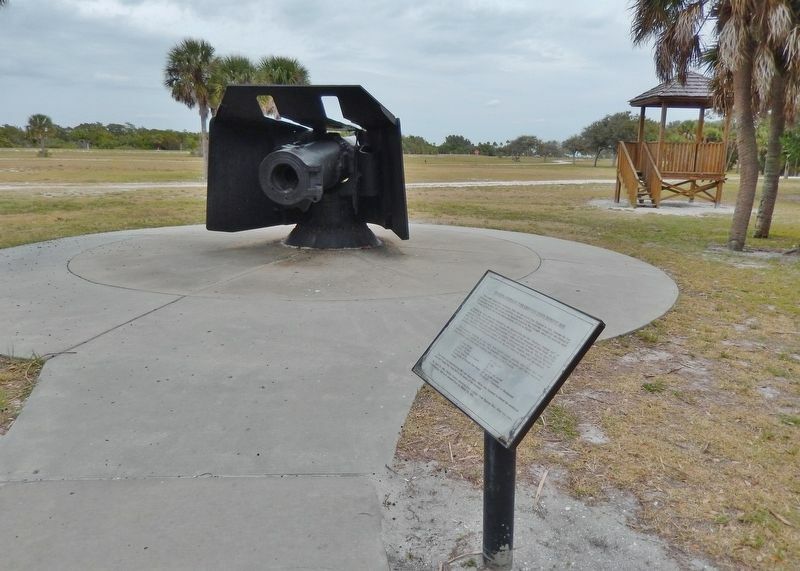 On April 12, 1980, Pinellas County recovered these cannons from Egmont Key. After two years of refurbishing, they were installed here on March 19, 1982. Location. 27° 36.91′ N, 82° 44.133′ W. Marker is in Tierra Verde, Florida, in Pinellas County. Marker can be reached from Anderson Boulevard (State Highway 679) 1½ miles west of Pinellas Bayway South, on the left when traveling west. Touch for map. Marker is located within Fort De Soto Park, just north of the Gulf Fishing Pier parking lot. Marker is at or near this postal address: 3500 Pinellas Bayway South, Saint Petersburg FL 33715, United States of America. Touch for directions. (within shouting distance of this marker); Fort De Soto Quartermaster Storehouse Museum (about 600 feet away, measured in a direct line); Tierra Verde Mound (approx. 3.8 miles away); Zephaniah Phillips' Homestead Site (approx. 5 miles away); "Pass-A-Grille" (approx. 5.1 miles away); Passage Key (approx. 5½ miles away). Touch for a list and map of all markers in Tierra Verde. More. 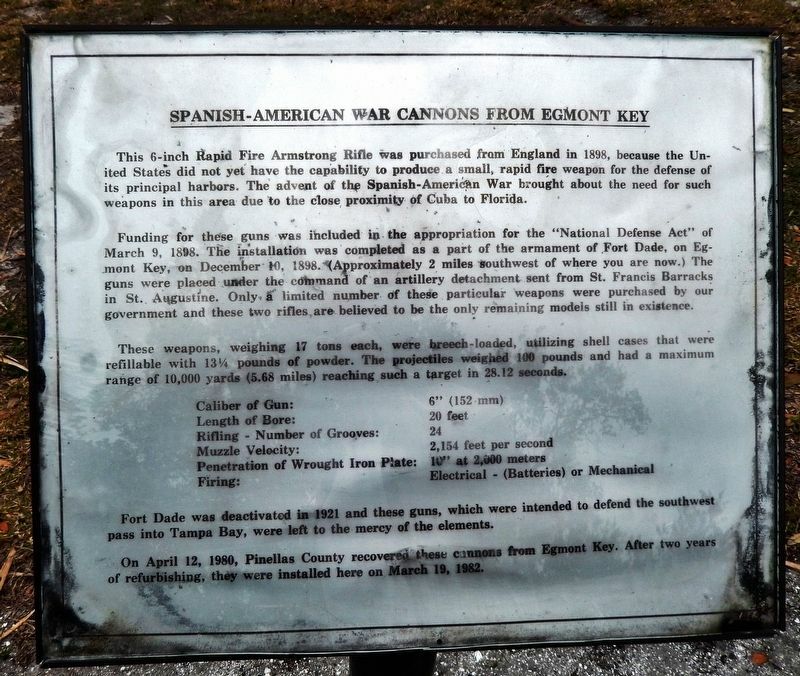 Search the internet for Spanish-American War Cannons from Egmont Key. Credits. This page was last revised on April 9, 2019. This page originally submitted on April 8, 2019, by Cosmos Mariner of Cape Canaveral, Florida. This page has been viewed 40 times since then. Photos: 1, 2, 3, 4, 5. submitted on April 8, 2019, by Cosmos Mariner of Cape Canaveral, Florida.